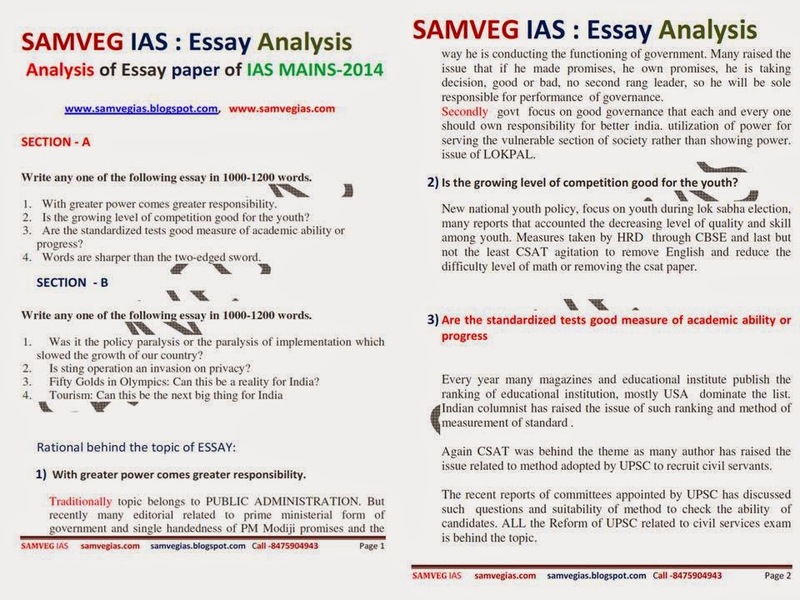 A typical essay UPSC asks candidates to write in the civil services Mains exam year after year is an expository or analytical one. Unlike literary essay which tend to be descriptive and narrative requiring candidate to explore his literary skills, expository essays demand reasoning and logic well argued with the help of relevant evidences and examples. There are certain steps to follow while attempting an essay in the civil services exam in order to get good marks. Choosing a right topic is the crucial part in Essay paper. First, read all the questions carefully. Instantly you will like a certain topic – tick it. Then prioritize other topics. See which one you think is easy to handle. Underline or circle a key word in each topic. Think over them for a few minutes. You will be given easy and difficult topics to choose from. Easy topics are chosen by the most and help in getting decent marks. Difficult topic is chosen by very few – they either get lowest or highest mark in it. If you want to play safe, choose the easiest one. In case you have prior experience of writing and comprehending complex topics, go for the difficult one. Usually, difficult topics are difficult to interpret correctly. They will be either vague or appear abstract. If you are familiar with such topics and correctly understand them, then go for them. Otherwise settle down for the easy topic. You would be ensured decent marks. Once you have chosen a topic, next step involves planning and brainstorming. Reread the question many times. Think over each word in it. You will observe that ideas start flooding from all directions. Write them down on a rough space.While thinking on the topic, don’t think about the examiner. Sometimes one tends to impress the examiner with big ideas. Avoid it. Let your impulse work. Let natural thoughts flow out on to the paper.Think all the possibilities that throw up and try to connect each with the topic. Whatever you write down, it must be related to the topic you have chosen.Most topics demand a balanced approach. Even if it is your express opinion, you should be objective and try to portray other aspects too. While brainstorming, think of such other possibilities too. Balancing doesn’t mean giving 50-50 share to both the views. It just means being objective and the tone should be subdued. Do this brainstorming on the first page itself. Write down all points legibly. Sometimes, a good examiner might be just impressed by your meticulous planning and be generous while awarding marks.Try to include examples, meaning of any jargon you might want to use in essay, or comments on particular argument of a person (if it’s an example in the essay) and evidences in support of your argument. Interlink each point you have jotted down. Prioritize and rearrange them by giving ranks. Eliminate irrelevant points. Again make sure that everything you have jotted down is relevant to The Topic. Use the number one point in the first paragraph after introduction.Now the raw material for your essay is ready. The blueprint is ready. If you don’t know the exact answer and you just beat around the bushes and write the garbage stuff to fill up the pages, while this tactic does work in the school and college exams but don’t try it in the ias mains exam essay paper. 4. Current scenario related to it. This time UPSC orientation is more Philosophical than last year.Except two direct essay ,they tried to provide level playing field to all aspirants.Effort of UPSC to provide level playing field to all and reducing the narrow view of preparation continued.Although good preparation and writing practice help to write better organised essay.So those who prepared well will be at advantage,but focus is on your creativity,broad thinking,ability to link the knowledge of various field in just those three hours. Q1: Lending hand to someone is better than dole. Motivation Behind the topic: we can see people are contributing fund for swachh bharat,Namami Gange,but not participating and not following in actual scenario.People has to participate,associate till result come to see the change. Q2: Quick but steady wins the race. Motivation Behind the topic: this is modified and modern day reality. earlier it was slow and steady wins the race.but now days it is impossible for slow to win the race. Govt organisation has to change their attitude to wards fastening the process.Technology has changed everything.But consistency is still required in system. Motivation Behind the topic: New govt and its Leadership.Political parties and their Leadership. Business and their Leader.Leader inspire,leader change the institution.scrapping of PC and establishing NITI AYOG shows influence of Leadership. Motivation Behind the topic:Too much emphasize by government on Make in india,manufacturing,Digital India, E governance pressurised upsc to ask such question.if Good written by candidate as there was no dearth of material will fetch good marks. Q2:Crisis faced in India:moral or economic. Motivation Behind the topic:PM deliver lecture on Moral values so offten.sometime it seems that everything can be made good if every one perform their respective duty wrt nation,society ,family and themselves morally. Q3: Dreams which should not let india sleep. Motivation Behind the topic:WOW!!! UPSC is impressed with Kalam sahab.A direct tribute to Kalamji.This was expected one.This essay will fetch very good marks if someone wrote it directly from his heart. UPSC itself is dream that didnot let candidate sleep. Motivation Behind the topic:most expected topic. everyone has prepared it well because of too much emphasize by governemnt,but twist is capitalism.hope candidate have taken care.